A beautiful January day in IL. This past weekend, I managed to sneak out on the water on a gorgeous 61 degree day. I have no idea how or why it we had a 61 degree day in January, but I wasn't gonna miss my chance to break the yak out. I met up with a bunch of new friends from Southern IL and we went to a local power plant lake. The fishing wasn't great, we did manage to catch some fish and I got to fish in shorts so I was a happy camper! One thing that I pondered while on the water was how do you determine what bait to throw (slow moving baits). I know everyone has their preferences and confidence baits, but what is the deciding factor when fishing a new lake? Is it the water clarity? Type of cover? Presence of forage? In my opinion that is A LOT to take into account when you are on the water, especially when you have a limited amount of time. Now let me preface, most will start with a reaction type bait to find fish, which I did but I couldn't get fish to commit. This lead me to slow down and begin throwing bottom contact baits and finesse baits. Its no secret that I love finesse baits. To be honest when the bite is tough you will see me jumping for joy as I pick up my spinning rod, while others are grumbling under their breath. What I do different is I power fish it. I can actually cover just as much water with these finesse baits as I can with a reaction bait. Now let's go over how I broke down the water! Trying to make a pattern happen. Now if you read a lot of articles from elite series pros, a lot of them will say to look for bait around the ramp. Whether this could be bluegills, shad, or crawfish. While I have found bait doing that, usually bluegill, sometimes you can not. One thing I have found that is easier is to look up the lake report. Many times you will be able to find a full list of aquatic species that are in that body of water. This can give you a general idea for color selection. Use these natural color hues and modify them with the water clarity. Say you have slightly stained water, I love to throw a lure that combines browns, greens, and blues. This color can match a variety of things, such as a bluegill or crayfish. A quote from Gerald Swindle "These are tiny little creatures with tiny little brains...We give them too much credit and overthink things". This is very much true. If you overthink things it will make things way harder than they should be! I usually will pick two starting colors depending on water clarity, clean water I usually start with green pumpkin/blue and brown/green and muddy water my picks are black/blue and black/red. Picking two starting colors that you think will best match the conditions will help simplify your life and give you a starting point for the hundreds of colors made by manufacturers. Next up is the body shape. The body shape is just as crucial the color. 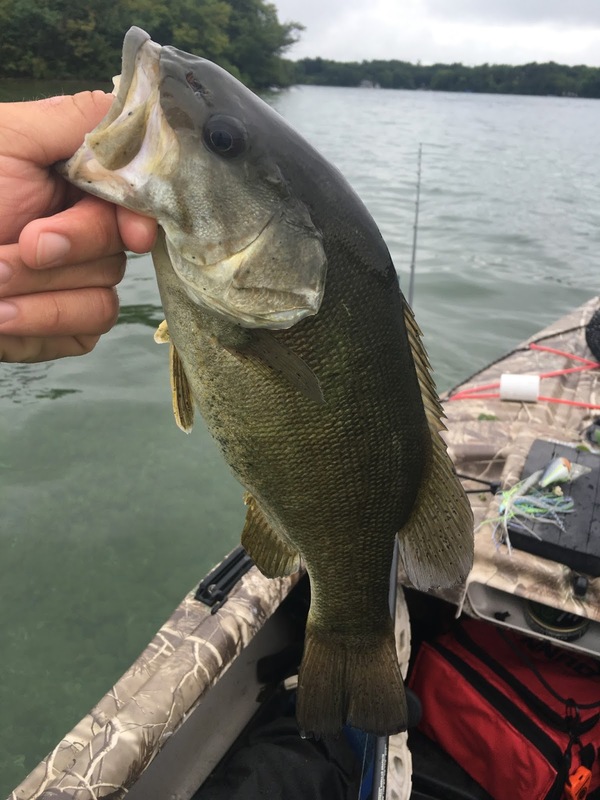 This past weekend I was fishing right next to my buddy who was throwing a summer craw beaver style bait, while I was throwing a summer craw/brown jig. He caught multiple fish working the same laydowns behind me. While our baits were the same color and had very similar silhouettes in the water, he was catching fish that I was missing. Don't be afraid to keep trying different body shapes. For me this is usually mandated a lot by the type of cover I am fishing. If there are rocks I am usually pulling out a jig. When fishing wood I really like throwing a shakey head. My all terrain vehicle for finding fish is a wacky rig. I fish it fast and I have several ways to rig it to work in all conditions. If I am fishing shallow I will rig it weightless with either a senko or a trick worm. To work the mid depth range 5-10 foot, I will use a trick worm with a nail weight in the head of the worm (Neko rig). 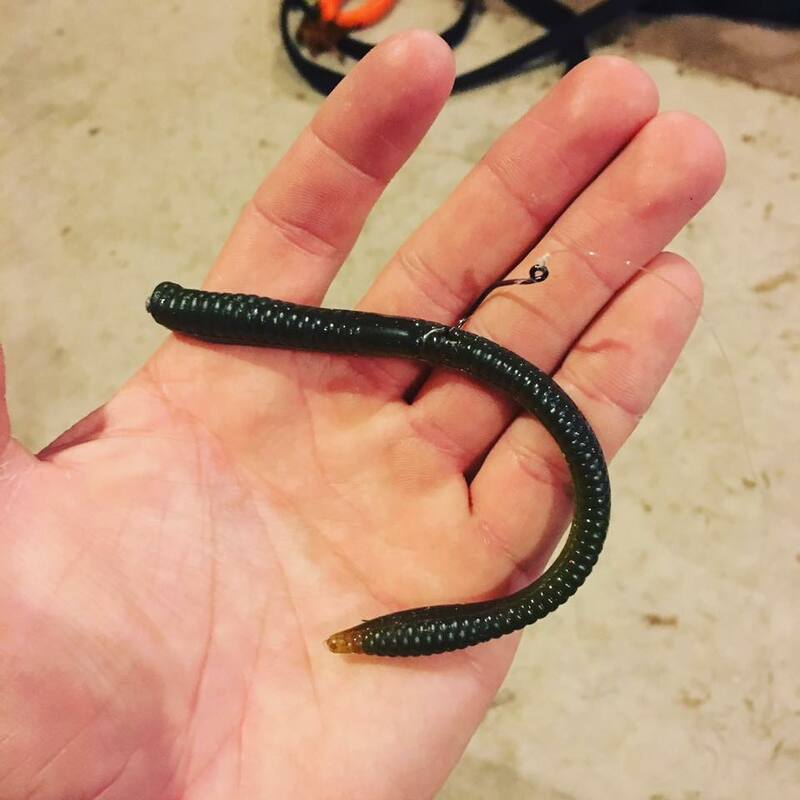 This essentially combines a shakey head with a wacky rig worm and can be very deadly! For deeper water 10+ feet or very slow fish (cold front) I will use a wacky rigged worm on a drop shot. While these aren't fool proof tips, they have helped me keep the skunk out of the boat countless times. Next time you are out there give this a thought and see if it can help you put a few more fish in your boat! It is inevitable in the Great White North. The scorching, humid, summer is followed by the blazing colors of fall, followed by the blistering winter. Said winter makes it difficult to kayak with ice thick enough to drive large vehicles on (though I have seen people attempt it). Thus, we kayak fisherman take this lemon and make lemon vodka. We bust out the shanties and ice poles, fill our flasks with vodka, and fill our ice-free coolers with beer (to keep it from freezing since it is so cold), and head out on the "hard water". Hard water is a beast of its own. Specific rods, reels, lures, bait, electronics, and augers to get you a hole through which you wet your line and (hopefully) retrieve some fish. In this area, others had been out sooner. Some die-hards will go out on questionable ice, crawling across with plywood, tied to their buddies with a long rope. Yes, I've kayaked in my fair share of conditions others wouldn't consider. But, for me, ice is too unpredictable. 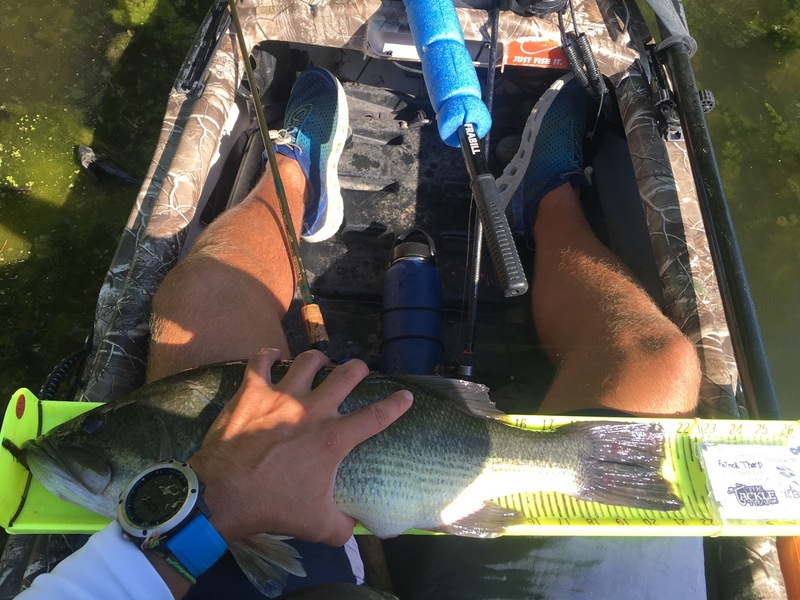 I can use my paddling experience to get me out of sketchy situations with my Bending Branches Angler Pro in my FeelFree Lure. But on ice, I am at the mercy of the ice and if it decides to keep me dry. I wait until it is plenty thick to head out. After a mild start to winter which included blistering cold, snow, rain, melting, and blistering cold again, I was late to hit the ice this year. I got out for my first hard water fishing trip over the new year holiday. My first trip was a quick one on my local waters with family. We drilled several holes. After a few hours, we landed many key-chain worthy Perch and a couple keeper bluegill. Though the bite was slow and the fish small, it felt good to get outside, get a line wet, and get some slime on my hands. The second trip, my daughter came out with me. She took a year on hiatus after stepping knee-deep into one of our ice holes the year prior. Her comment,"Why did you put the holes inside the tent?!?!?!" Now that her foot is bigger, and she understands the "tent" isn't for camping/playing, she was eager to get back out. 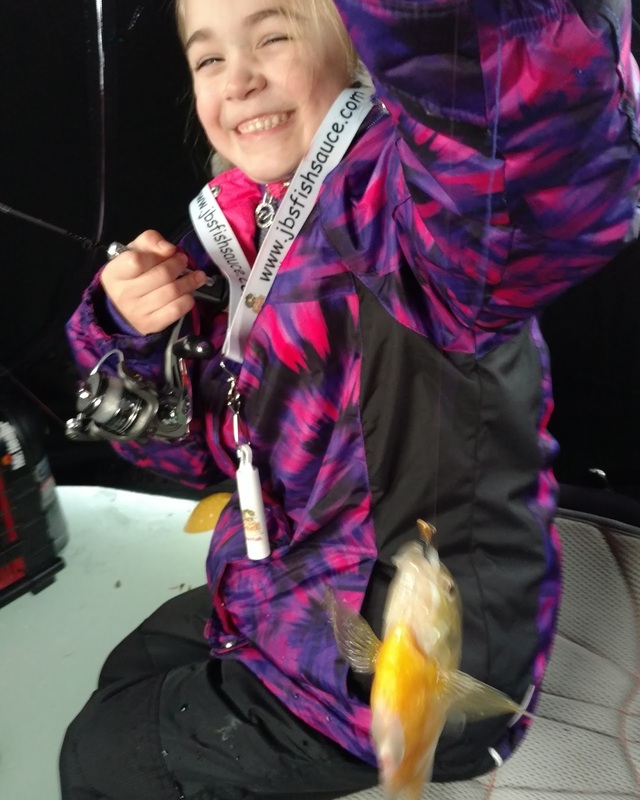 We landed a few nice fish, and she managed to catch the biggest crappie and bluegill of the day. Though she eventually grew bored, we had a blast fishing and chatting in the "tent". The next day, I headed out for a day-long trip with my buddy Chang Lor of www.cxfishing.com. This was his first time ice fishing, ever. I was excited to show him the ropes, and he was excited to try it (though I think he is disappointed there is no topwater bite ice fishing). The day was warm (20s), but an incoming snow had it cloudy with high winds. The winds bite through our layers, making time outside the warmth of the shanty difficult. I put a hole in the ice and drop a Panfish Plastics Chigger Fry marinaded in JB's Fish Sauce into the hole. I give Chang his crash-course on reading a flasher sonar and quickly pull a small Perch out of the water. I would have preferred to do some scouting for a prime location, but frostbite was not in my plans for the day. Given the conditions, I setup the shanty quicker than I'd like on one of my usual ice spots and fired up the Mr. Heater. In a short time, the shanty is warm and we are marking fish. Chang lands his first fish on ice, a small Perch! It seems he may be hooked (pun fully intended). We are both pulling a variety of Perch, Bluegill, and Crappie out of our holes. 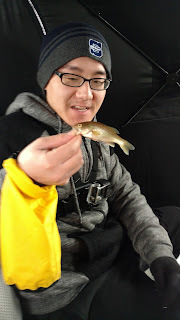 Chang had his lure dialed in with a black Panfish Plastics Chigger Fry marinaded in JB's Fish Sauce. I had to switch colors a few times to find another color that worked well (I don't like to fish the same colors in both holes). 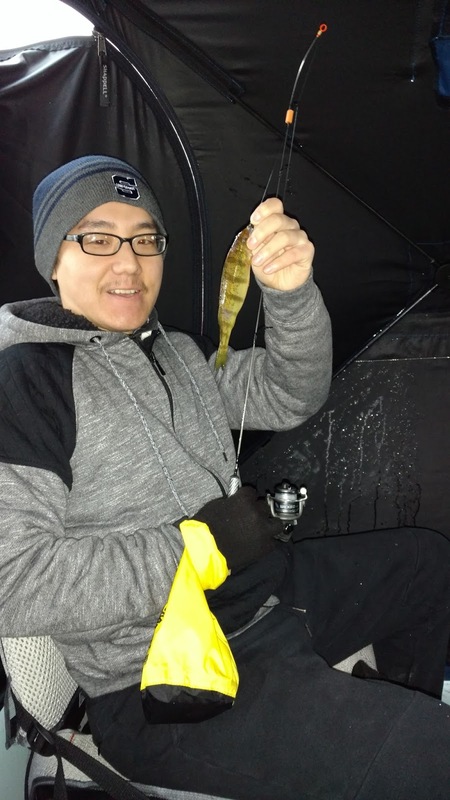 After a few waves of fish (fish will come through in schools at various intervals when ice fishing), we come to a bit of a lull and rig up a tip-down and a whip-up with crappie minnows. During said endeavor I manage to completely lose my feet under me and mess up my back, but forge on. 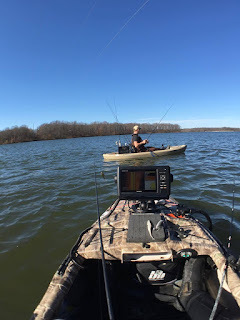 After successfully setting the crappie minnows, we head back into the warmth of the shanty where we land some more fish before another lull in the bite comes. We decide to adventure into the bitter wind and do scouting in deeper water armed with the Panfish Plastics Chigger Fry. I apply a layer of JBs Fish Sauce to the hook and jig head. I drill a few scouting holes, check the depth and activity with the Vexilar. After repeating this exercise three times before we locate a spot with a large school of fish. We begin jigging but most of the school moves out without biting. We are about to give up when my spring bobber dives quickly. Fish on! I start reeling in the unknown fish with the smaller of my ice poles spooled with 2 lb. test. Bluegill put up a great fight, this feels like a bluegill. Yet, it feels larger. My suspicions are confirmed when I get the fish to the hole. It IS a bluegill, the biggest one I've ever caught! As my mouth drops, so does the fish. I let my line go slightly slack, enough for the fish to shake off the hook back into the hole. I quickly dive to the hole, sticking my hand into the icy water. I have saved my fair share of fish this way when ice fishing. But this time, the time it really counted, the fish swims away into the darkness below. At this point I'm disappointed and we are freezing. The fish are gone, this location is about as active as our current one. We opt to head back to the shelter of the shanty and carry on. We continue fishing the original spot, catching some nice Bluegill and Crappie. Chang manages to land his first bass on ice and his first for 2017, it is a beast! He sets a goal to best this early-year personal best. I am confident he will do it. We enjoy a few more hours of fishing then the bite slows. We have 9 keeper panfish and decide to call it a day. We go through my packing ritual and part ways. We plan to hit another location with some monster Pike next time (but on a warmer day when we can run to tip-ups). Ice fishing is fun in its own way. Some live and die by it. I live and die by kayak fishing. Ice fishing, however, temporarily satisfies my fishing appetite and fills my freezer with tasty panfish. I look forward to the next trip where we hope to pull some monster Pike and Bass through the ice. As 2016 has finally ended and 2017 begins, it bring a new year of possibilities both in fishing and in life. 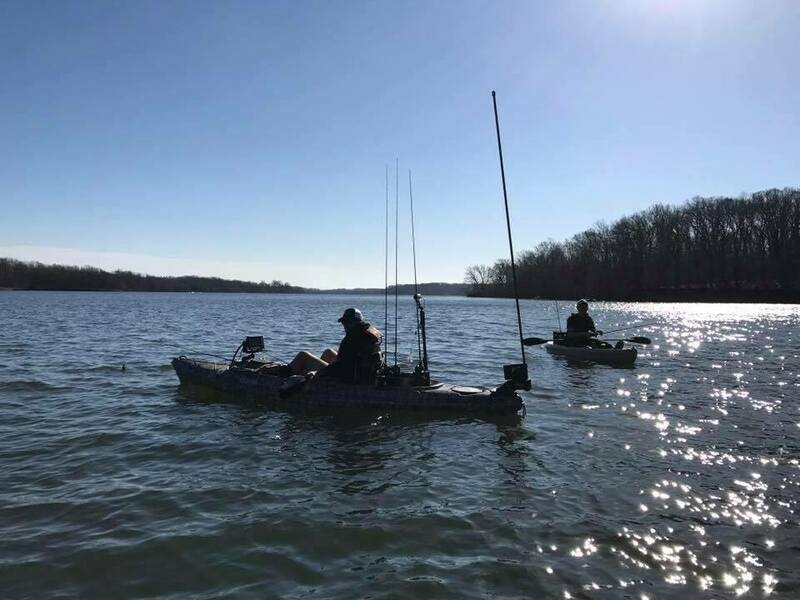 While for some our kayak fishing season has ended, but for others it is starting to heat up as fish will be making their way to beds within the next few months. Whether you are able to fish or not, there is always something to do. Lately I have been cleaning reels, organizing tackle, and replacing rusty hooks. 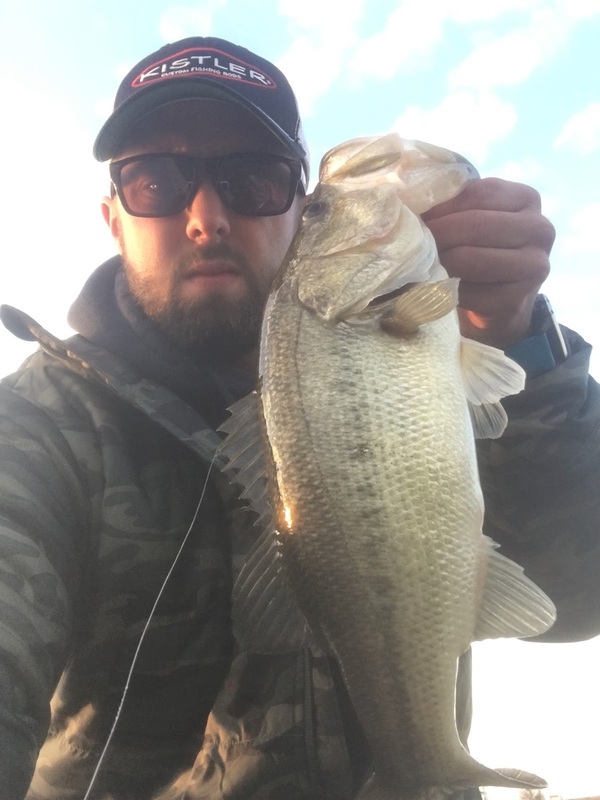 While these tasks might not be as fun as getting on a school of toads, they are crucial tasks that need to be done to ensure proper and efficient use of your time on the water. I would much rather do this stuff now, to allow me to be on the water as soon as everything unthaws! New PB, 21.5 inches, from 2016! Now let me preface that I have never been a huge goal type of guy. A lot of times I make decisions as they come to me rather than a long distance goal that I could lose motivation to accomplish. 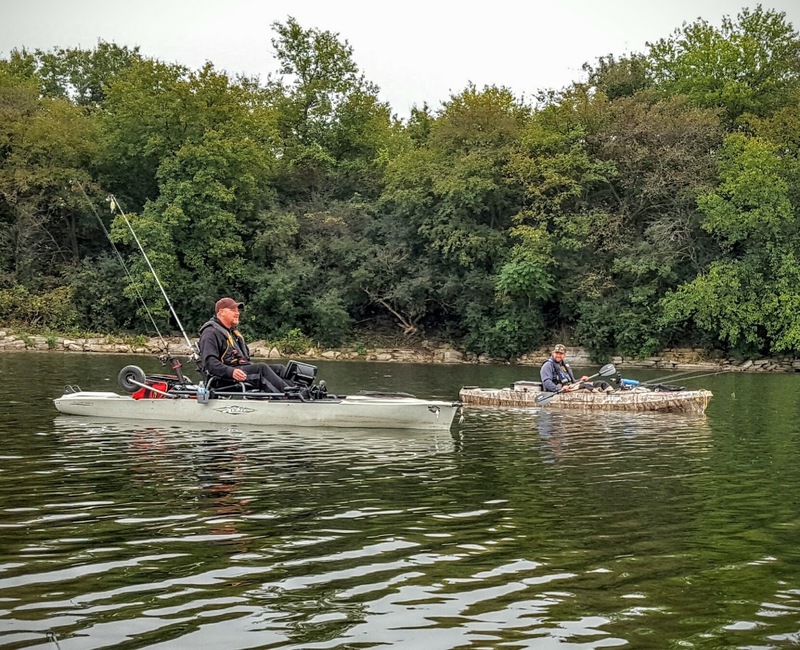 My kayak fishing goal for 2016 was to make the KBF National Championship. 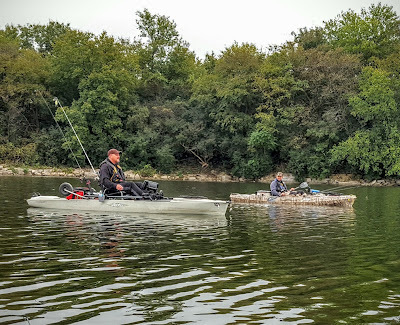 While this was my first year in the kayak fishing scene, I was very thankful for the opportunities I have been given and the friends I have made. I look forward to 2017 and the many adventures it holds as I attempt to take a run at the KBF AOY through the KBF Trail and online events. Now for what's new in 2017! As 2017 begins I reflect back upon everything I did in 2016 and came up with a few major areas that I think I could vastly improve on. Don't sweat the small stuff. This is something that use to eat me up when I would go fishing. Even when fun fishing, I would get furious with myself when I would forget stuff. Instead in 2017 I fully intend on making list to make sure I don't leave the essentials at home! Sticking with your strengths. One thing that I have realized while fishing many live tournament events is that you can't try to do too much. There were many times when I tried to make a bite happen that simply wasn't there. I also tried to fish tactics that I had no previous practice with, when there was money on the line. In 2017 I have a goal of adding more techniques to my strengths during practice and trying new and revolutionary tactics to give me a larger background knowledge when I need it, but when money is on the line I will work on sticking to my guns and doing what I already excel at. Explore new places. In 2016 I hit the water a lot...I mean a lot a lot. One thing I keep kicking myself about is not exploring new places. I would say 3/4 of my fishing was at one small community lake. Towards the end of the season I started exploring some other creeks and rivers and found some massive fish in them! In 2017, I fully intend on exploring more of these hidden gems in search of some giant bass! Don't forget to have fun! In lieu of the countless online tournaments you can be in at any given time, it can be over-whelming. Many times you can let your competitive edge get the best of you. I found that in many instances this past summer. No one likes losing a big fish but in the tournament mindset it can make you feel like the world is going to stop turning. Many times you just gotta learn to shake it off and remember that THIS IS SUPPOSE TO BE FUN...better said than done! Overall 2016 was an amazing fishing year for me! I managed to spend over 100 days on the water, met a ton of amazing new friends, had some high tournament finishes, go the great opportunity to write for this blog, and completed my major 2016 goal of punching my ticket to the KBF National Championship! What more can a guy ask for in their first year of kayak fishing! I have super high hopes for 2017 and will continue to strive to be the best fisherman, friend, and promoter of the sport to anyone I meet along the way! I have big hopes for the 2017 season as I make a run for the 2017 KBF AOY! Follow my journey on here as well as my personal instagram and facebook. Be sure to say hello if you see me at any KBF Trail events! If anyone ever wants to go fishing, drop me a line! I'm really looking to meet new people and fish new places! Good luck to everyone this coming season! I wish you the best of luck ;). Cheers to more toads in 2017!